Up to the twenties of the previous century, goods trains of all German railway administrations were operated with manual brakes. In addition to the locomotive personnel, the crew of the train therefore included a chief train conductor as the highest authority, a master packer, train conductor and shunter as well as several brakeman. These persons were responsible for braking the train, for the shunting work during stops en route, and the exchange and processing of freight documents of the transported goods. For this purpose, a special accompanying wagon was carried along behind the locomotive that served as a rolling working and recreation place. Only the brakeman had to stay in one of the brakeman's cabins during the trip. 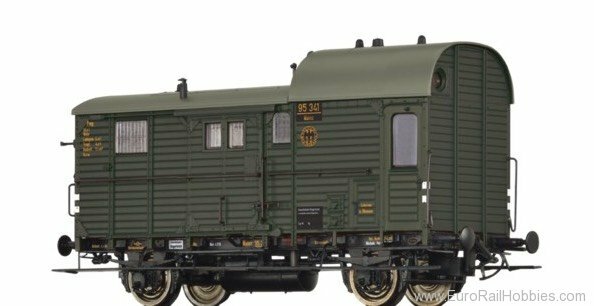 Completing the own development, the KPEV (Royal Prussian Railway Administration) procured luggage wagons (Pwg) according to master drawing pr IIa 13a for the first time in 1913/14. After the end of World War I, this design was selected as replacement of the old or missing accompanying wagons of the most German Lander railway operators. So, over 7,000 Pwg were built according to the 2nd revised edition of the master drawing until 1929 and spread not only in the former KPEV region, but also in Baden, Bavaria, Wuerttemberg, and Saxony. Starting at the end of the thirties, the DRB removed the through-going running boards and handlebars, allegedly due to an attempted robbery of a train. Additional structural alterations even before the outbreak of the war included reinforcements of the wagon body frame and the removal of the window in the storage space door.